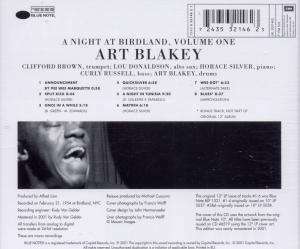 Der Artikel Art Blakey (1919-1990): A Night At Birdland Vol.1 (Rudy Van Gelder Remasters) wurde in den Warenkorb gelegt. 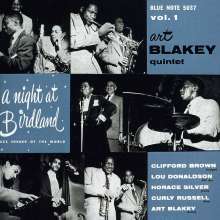 On the evening of February 22, 1954, Blue Note recorded Art Blakey's quintet at Birdland and the jazz landscape changed forever. Art Blakey, already the most exciting drummer in modern jazz, established himself as a bandleader with an ear for young talent. Trumpeter Clifford Brown, alto saxophonist Lou Donaldson and pianist / composer Horace Silver became major players on the scene. Added to each of these historic albums are two bonus tracks from that night. Personnel: CLIFFORD BROWN, trumpet; LOU DONALDSON, alto sax; HORACE SILVER, piano; CURLY RUSSELL, bass; ART BLAKEY, drums.